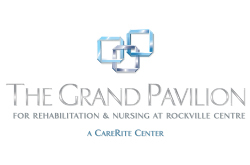 Founded in 1969, The Grand Pavilion for Rehab and Nursing is Long Island’s premier location for short-term rehabilitation, sub-acute care, and long-term nursing. Renowned for their warm atmosphere and exceptional standard of care, patients and residents enjoy the finest amenities and a uniquely personal level of attention. Their HealthBridge Rehab program offers cutting edge techniques and individualized care, ensuring the highest level of recovery and enabling you to get back on your feet as quickly as possible. The Grand Pavilion is conveniently located near area hospitals, including Mercy Medical Center, South Nassau Communities Hospital, and Franklin Hospital Medical Center, easing the transition from hospital to healthcare facility.